Exercise for the over-50 crowd is decidedly healthy. Exercise for the over-50 crowd is decidedly healthy. As people age, several changes occur that exercise can help slow or reverse. Metabolism slows, leading to increased fat accumulation. Artery passageways often narrow, leading to higher blood pressure and lowered flow. Bones become thinner and more porous, a condition known as osteoporosis. Muscles and skin lose tone. Those effects can be retarded or even turned back to a degree with regular, age-appropriate exercise. The American College of Sports Medicine suggests 15-60 minutes of aerobic (oxygen-enhancing) exercise a few days per week. One goal among others is to raise the heart rate to 60-90% of the safe maximum (220 beats per minute, minus your present age). A good cardiovascular workout - a 30-minute brisk walk or three 10-minute walks per day, mild jumping jacks, gentle jogging in place, swimming, a dance routine or any other method - helps keep the heart and blood vessels healthy. 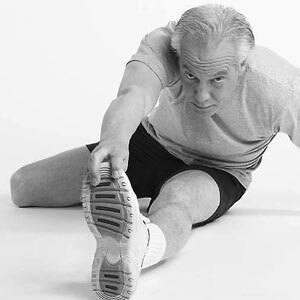 Gentle static and dynamic stretching exercises help keep muscles flexible and joints lubricated. That helps out with balance, but it also maximizes range of movement. That means better coordination and less pain during both exercise and everyday activities. Endurance exercises help keep the heart and lungs healthy as well as keeping muscles toned, joints moving freely and other body systems functioning well. A slightly higher metabolic rate stimulates a variety of organs to produce needed biochemicals. The human body functions better, longer when it is subject to mild activity than when sedentary for long periods. All these activities help raise the onset age of osteoporosis and to minimize its effects after it begins. Non-insulin dependent diabetes mellitus is less likely for the physically active. Certain forms of heart disease are less likely for those who exercise moderately later in life. There is ample evidence that moderate, regular exercise helps the psychology as well. It can decrease the severity of depression and heighten mood. The social aspects can help with the isolation that older people sometimes feel, especially as friends and loved ones are no longer part of their lives. Older people should consult a physician or trainer (preferably both) before starting any new exercise program. Begin slowly, especially if exercise has not been part of your lifestyle. Build up flexibility, strength and endurance gradually. If you have a medical condition, be sure to discuss your plans with a physician and sports expert to develop an exercise routine appropriate to you.